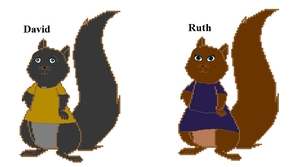 Base number 131, various animals from the show; a chipmunk, a mouse, a skunk, a ferret, a squirrel, a beaver, an otter, a rabbit, a raccoon, a caterpillar, a wasp, a bee, a ladybug and a cricket. The baby kangaroo/joey and parrot are not found in the actual show and were made by me. Do you think you could make one with some snakes or rats if you'd like? Is there one with a Chihuahua? I don't think so. Not yet. You're welcome. Sorry I didn't have what you needed. There's a Macaw . . . . You rock! That's my MLP OCs friend/pet. Lol, I know it is. XD thanks for the base helps me alot! The otters face. THAT FACE. THAT FACE THO.